You may notice from my lack of Emmy picks, red carpet attention or speculation on how Stephen Colbert will do as host, that the results of the 69th Academy of Television Arts and Sciences weren’t of much concern to me either. Yes, I’d agree that “The Handmaid’s Tale” and “Atlanta” deserved to win, and i was also glad that they were also recognized earlier this summer at the much less reported TV Critics Association Awards, in which I actually got to cast a vote. I was happy that “The Night Of” got some attention as well, as I thought the excellent drama was sort of ignored in its time. That it was overlooked as an HBO limited series on awards night by the glossier and emptier “Big Little Lies” shows the enduring power of movie star names in service of a murder soap so strangely constructed, not only did we not know the murderer, we didn’t even even know the victim until the end. My ongoing surprise was that the delicious Hollywood miniseries “Feud: Bette and Joan” got nothing; is there a Ryan Murphy backlash I don’t know about? And what about “Fargo”? I am among those who do not think the series has faltered as the seasons have gone on. And were even the nominations for Noah Hawley’s mind-blowing other series, “Legion”? Some are griping that Julia Louis-Dreyfus shouldn’t take home a comedy Emmy every year, but the things she does on “Veep” go beyond reading funny lines and more like wrenching the humor out of every look. She deserves it. Women did well in many categories and that was cool. And there was obviously an effort to nominate a lot more people of color, as well as making them presenters. 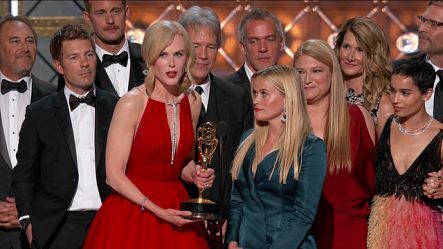 But the fact the one guy who was most egregiously cut off in his acceptance speech was Sterling K. Brown showed some sort of bias (Miss Nicole Kidman went on so long it was as if she was awaiting the musical cue). The political undercurrent of the event was so understood that no one message stood out. Colbert as host reached a part in his opening monologue where the Trump stuff started and it hardly ever stopped after that. His suggestion that Trump would have sought no higher office if he had only won an Emmy for “The Apprentice” probably wasn’t true. And before you ask how his show even get nominated in the first place, consider that it was another Mark Burnett-produced concoction, “The Voice,” that won this year. (Really? Based on what?). For all of his ratings bumps, I don’t think Colbert has really found his voice yet. He’s a little too smug here and in late night, where he doesn’t show that much interest in his guests. Seth Meyers is still more sharp and relentless on the Trump material. And once Sean Spicer becomes part of your act, then you’re in Jimmy Fallon/Trump hair-mussing territory. Colbert seemed prematurely bitter, too, when John Oliver kept winning in his category, griping that he only had to do his show once a week. But Oliver was, if anything, a political vote of confidence, as were most of those in this year’s winning column – from “Handmaid’s Tale” to “Veep.” As if voters were trying to reiterate their votes, 10 months later.